For years Colombia remained an undiscovered gem shrouded from visitors with regions isolated due to conflict, but now there has never been a better time to visit Bogota- the vibrant capital city of Colombia. With a unique position that borders the Pacific, Atlantic, and Caribbean Oceans, Colombia has five different thermal floors- warm, temperate, cold, as well as high elevation and perpetual snow providing a diverse and rich landscape of provisions indigenous to each region dictated by nature’s extreme elements. Until recently, Bogota’s gastronomic scene remained under the radar until now, as their top chefs are gaining international recognition and breaking the boundaries of Latin American cuisine. As an important city in the Latin American culinary landscape, Bogota is host to the The 50 Best Latin American Restaurant Awards for the next two years. Recognized as the best Latin American Female Chef is Leonardo Espinosa, who heads her namesake restaurant Leo. 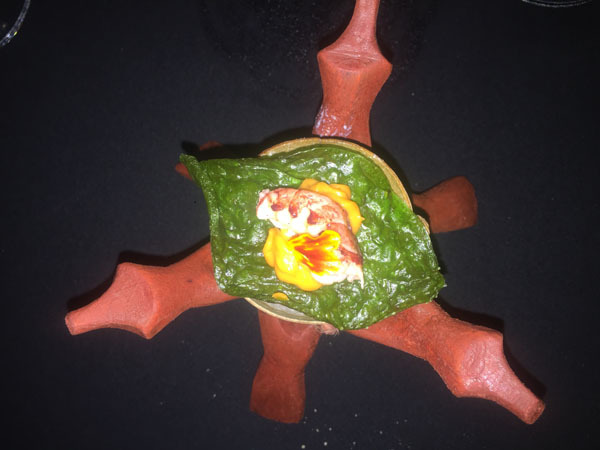 Considered to be amongst the top restaurants in Bogota, Leo uses indigenous ingredients only found in Colombia and creates modern interpretations of each region’s most revered dishes. Together with her sommelier daughter Laura Hernandez-Espinosa they have created a 12 course pairing menu based on ancestral knowledge that defies traditional cuisine with a daring approach but remains distinctively Colombian. Some of her exotic creations are tuna topped with Santander ants, and Capybara, a wild rodent, paired with ponce. To dine at Leo is to experience Colombian cuisine at i t’s finest. Misia which translates to My Lady, is Leonardo Espinosa’s more casual outpost that is inspired by the street food culture of Colombian cuisine from the soup kitchens, traditional wood burning stoves, and the street kiosks that sell guarapos, juices and raspaos. The menu is made up of traditional Colombian comfort dishes, casual street foods, and fresh juices created from local exotic fruits served in an airy and colorful dining room that evokes Colombia’s vibrant culture. Andres D.C. is the urban version of the popular and multi sensorial Andres Carne de Res conveniently located in the posh Zona T. Celebrating life in a grand scale, each floor in this massive 4 story entertainment venue is themed after Hell, Earth, Purgatory and Heaven and filled with representative kitschy relics centered around The Sacred Heart. The closest American equivalent would be The House of Blues, with a dose of Beetlejuice thrown in for good measure. 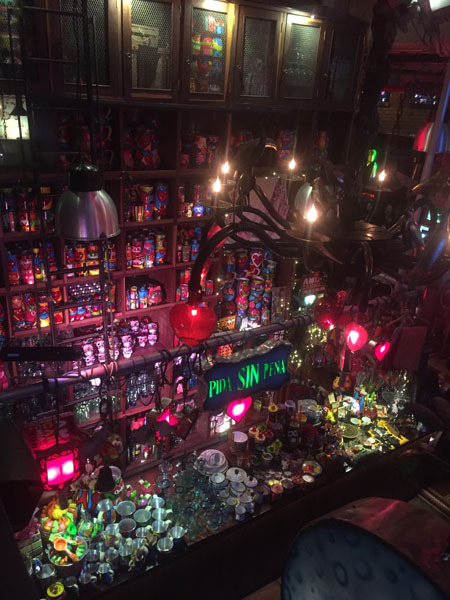 Their extensive 66 page menu encompasses traditional dishes from every region in Colombia as well as 22 pages of drinks including exotic juices and potent concoctions to fuel a long night out. Be sure to try their succulent grilled and marinated tenderloin options, empanada de carne, or fried pork belly to whet the palate. After dinner be sure to engage in the fun filled party atmosphere with a local aguardiente cocktail and live music and dancing for the full experience. Making the list of Latin America’s 50 best Restaurants, Villanos en Bermudas is headed by Bogota’s notable rising new chefs Sergio Meza and Nicolas Lopez. Offering an eight course menu which changes daily depending on availability in the market, this renegade hipster duo is putting their mark on the culinary map with their daring and creative sensibility and modern interpretation of haute Latin American cuisine. Housed in a 70s style post modern townhouse filled with mid century style furniture accented with street art on the walls, this contemporary backdrop sets the stage for their artistically plated dishes that epitomize the new dining scene in Bogota. 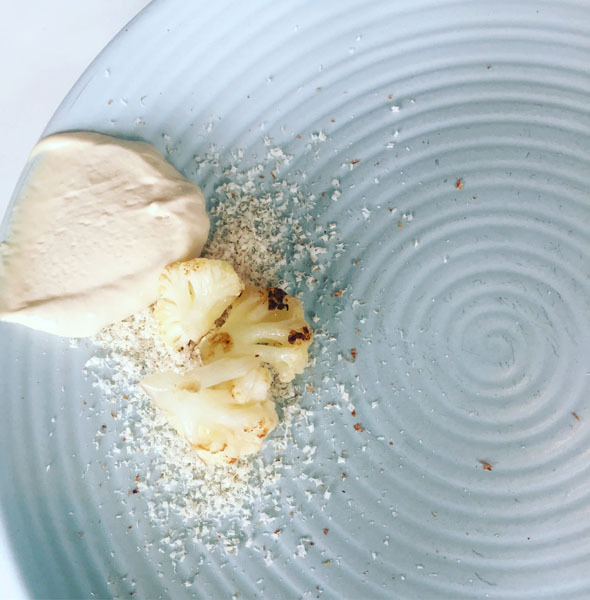 Standout dishes include the crispy thin chicken skin wafer, a spicy raw lamb tartare, and buttered grilled cauliflower paired with grated goat cheese and sunflower ice cream for dessert. Of course the dining experience wouldn’t be complete without a bespoke cocktail made with a custom liquor infusion. Located adjacent to the park is a popular local spot for breakfast, lunch or brunch- Canasto Picnic Bistro. This airy gem is housed in a gorgeous greenhouse setting that brings nature indoors. 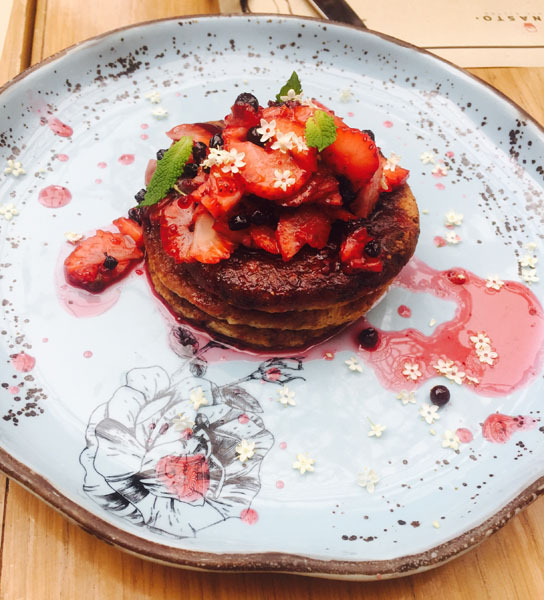 Chef Alejandro Cuellar specializes in edible flower gastronomy and serves healthy renditions of traditional Colombian dishes made with locally sourced ingredients that are as beautiful as they are delicious. Be sure to indulge in the fresh pressed exotic fruit juices to taste the bounties of Colombia. 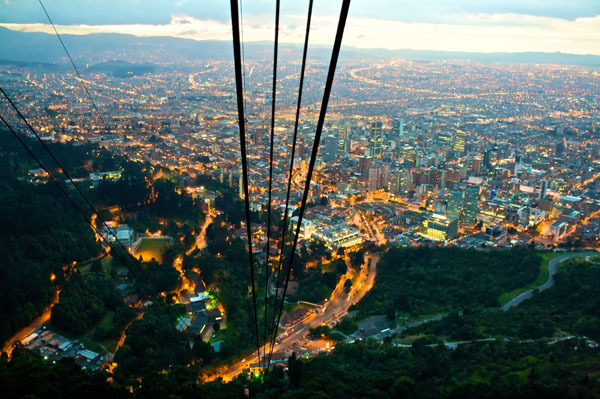 Though Bogota is already over 8,600 feet above sea level, this vertiginous city has a beautiful mountain in the center, Monserrat which tops out at 10,341 feet and offers panoramic 360 degree views over the sprawling city. A popular spot for admiring the sunset, you can access the viewpoint by tramway or funicular and visit the quaint and peaceful 17th century church as you are that much closer to the stars. Visit the colorful colonial town of La Candelaria in downtown where old meets new and vibrant graffiti art sits alongside 17th century architecture. 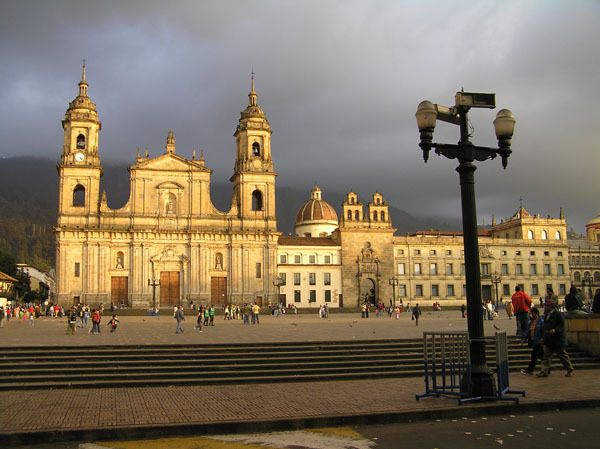 The most iconic site is Plaza Bolivar, named after Simon Bolivar, the leader who liberated Colombia from Spain, is at the heart of La Candelaria and the center of government buildings and adjacent to the President’s Residence. Situated in the center of the posh T Zone is the luxurious five star Sofitel Bogota Victoria Regia named after an elegant Amazonian water lily. Located in the center of Colombia’s most famous shopping and gastronomic district the Sofitel marries its chic French style with the elegance of the neighborhood. Rooms are luxuriously appointed with plush signature beds, marble bathrooms with glass rain showers and outfitted in the latest technology to ensure a comfortable stay in this exciting city.